Flowers create color and texture in the garden. Some flowers are more unusual than others and flowers with unusual shapes always get attention. Some of the flowers with the most unusual shapes are flowers that are shaped like balls or spheres. In most cases the flowers are actually a round-shaped cluster of many blooms of one color that give the appearance of a ball. Ornamental onions produce flowers that are globe shaped. There are several different varieties with different sized ball-shaped flowers. 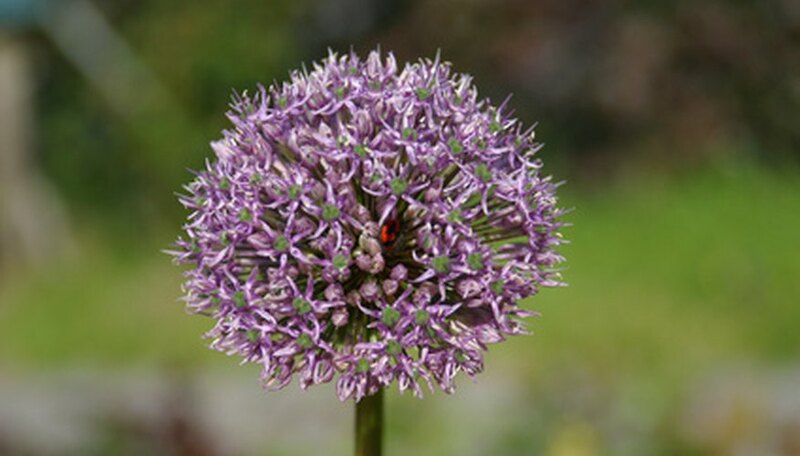 Common varieties available are the Drumstick Allium (Allium sphaerocephalon) with quarter-sized flowers, the Allium giganteum with softball sized flowers and the Globemaster allium with ball-shaped flowers the size of vollyeballs. All varieties prefer well-drained soil and can naturalize if grown in the right conditions. Ornamental onion flowers make long-lasting and interesting cut flowers. The craspedia flower is the flower from a perennial also known as the billy button or drumstick flower. The golden yellow, perfectly round flowers are held aloft 18 to 24-inch, leafless stems. The flowers are about an inch in diameter. Craspedia is a native wildflower in Australia and New Zealand but is grown in gardens across the United States. The craspedia flower makes a long-lasting cut flower and is often used in professional floral arrangements. The hydrangea is a popular cut flower that is produced on a garden shrub grown in most parts of the U.S. The flowers are large, up to 6 inches or more in diameter, and are pink, white, green or blue depending on the variety. Hydrangea shrubs prefer protection from hot afternoon sun, if grown in the garden, as well as plenty of moisture. The ball-shaped hydrangea flowers are a popular cut flower often used in wedding floral arrangements. Hydrangeas Hydrangeas: Where and How Should a Hydrangea be Planted?